Recovery of bad debts has become imperative to the business sector. Besides going by the usual litigation process under recovery suits, now the insolvency laws have made it easier to speedily dispose of recovery cases. 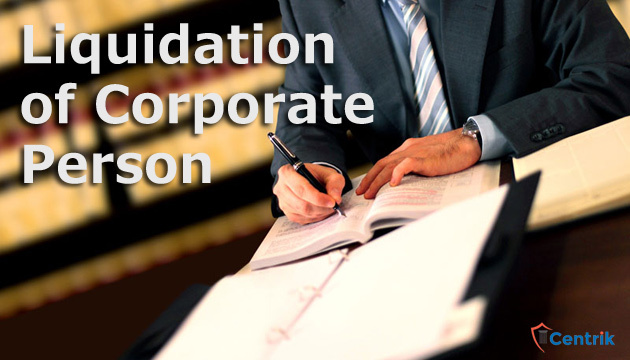 In this article we have discussed about liquidation, its initiation, contents and when Adjudicating Authorities can pass an order for it. The first step is to make efforts to revive and restart the corporate person by preparing ‘resolution plan’. If that does not work, next process is liquidation i.e extinction of corporate person. Revival or liquidation is required to be made in time bound manner. Hence, rigid time frame has been specified. Resolution plan required under section 30(6) of Insolvency Code, 2016 is not received before the expiry of the insolvency resolution process period or the maximum period permitted for completion of the corporate insolvency resolution process under section 12 of insolvency Code, 2016 or the fast track corporate insolvency resolution process under section 56 of insolvency Code, 2016, as the case may be. Adjudicating Authority (NCLT) rejects the resolution plan under section 31 for the non compliance of the requirements specified. Before approval of resolution plan, if resolution professional intimates to NCLT the decision of committee of creditors to liquidate the corporate debtor. If resolution plan approved by Adjudicating Authority is contravened by corporate debtor, any person other than the corporate debtor, whose interests are prejudicially affected by such contravention, may make an application to the Adjudicating Authority for a liquidation order. If adjudicating Authoriuty determines that the corporate debtor has contravened the resolution plan, it shall pass liquidation order. An order requiring the corporate debtor to be liquidated in the manner as laid down in the Code. Require such order to be sent to the authority with which the corporate debtor is registered. The liquidation order passed by Adjudicating Authority has following effect. No suit or legal proceedings by or against corporate debtor- Subject to section 52 of Insolvency Code, 2016, when a liquidation order has passed, no suit or other legal proceeding shall be instituted by or against the corporate debtor. However, a suit or other legal proceeding may be instituted by the liquidator, on behalf of the corporate debtor, with the prior approval of the Adjudicating Authority- proviso to section 33(5) of Insolvency Code, 2016. The provisions of section 52(5) of Insolvency Code, 2016 shall not apply to legal proceedings in relation to such transactions as may be notified by the Central Government in consultation with any financial sector regulator- section 33(6) of Insolvency Code, 2016. Section 52 of Insolvency Code, 2016 makes provisions relating to rights of secured creditor in liquidation proceedings. Liquidation order for liquidation under this section shall be deemed to be a notice of discharge to the officers, employees and workmen of the corporate debtor, except when the business of the corporate debtor is continued during the liquidation process by the liquidator- section 33(7) of Insolvency Code. Recovery procedure can be initiated in either ways under the insolvency laws.